Diamine inks have been ink manufacturers since 1864. 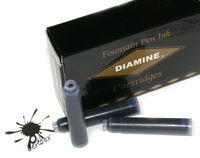 Diamine fountain pen ink is water based and suitable for any brand of fountain pen. There are over 100 colours available and Diamine ink cartridges are available in over 20 colours. Registrar's ink is also available in 30ml and 100ml bottles. 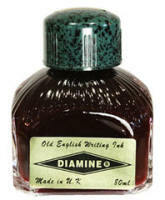 Featured Diamine ink is normally in stock and posted on the same or following working day. Diamine ink is £5.99 per 80ml bottle. The Diamine ink samples below are representative of their inks, but their display may vary due to monitor settings and other factors. We stock over one hundred colours and a full colour chart can be viewed here. Diamine ink cartridges, £4.99 (boxes of 18). International standard cartridges suitable for many makes of pen. Diamine Registrar's ink in 30ml (£6.90) and 100ml bottles (£10.99). Registrar's blue/black ink as used for official documents and suitable for archival use and record keeping. This ink will remain legible for hundreds of years. 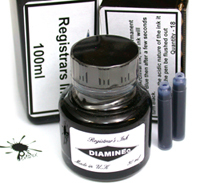 Note: Diamine registrar's ink cartridges have been discontinued and are no longer available. Penbox also accept telephone orders and enquiries.